Some women prefer long hair, and some women prefer short hair, but most have one thing in common: they love pining about them. Pinterest, which has taken the world by storm, has become a hot-spot for anyone looking for anything new and exciting. This includes the newest and most exciting hairstyles. There are hairstyles for any size, shape and possible interest anyone could want. With all of these many hairstyles available, below are the top ten. Just to help with narrowing it down if you’re looking for a new hairstyle. This is great news for anyone who suffers from dreaded cow-licks, where straight bangs just don’t work. Side-swept bangs work perfectly for almost any type of hairstyle, whether you prefer a pixie cut or long hair. 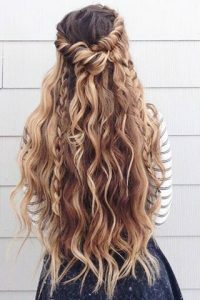 This fun and flirty hairstyle is currently being rocked on the red carpet by many celebrities, and, in a strange turn of events, look just as good on someone who doesn’t have a whole army to do their hair every day as they do on celebrities. The good news is that braids are back! Not “Little House on the Prairie” braids, but modern and chic. The main look for these beautiful new braids is chunky, half up look. These funky braids can go upside down, around the top, chignons, buns, and anything else that the imagination can come up with. The key to a great braid is to make it seem as complicated as possible, yet be easy to throw in at any time. Want a new hairstyle but don’t want to cut your hair? Try braids on for size! Actual wet hair usually looks fabulous. It’s easy to style it lies flat, and there’s no annoying static. Then nature takes its course, and it dries. It always seems to dry in the exact opposite style you had planned. Or it just dries frizzy, and no one likes frizzy. The solution? The wet hair look. Thankfully for all, it’s finally come back into style. With modern strides in hair products, a whole tub is no longer needed to achieve this. Just spritz with some hairspray, and use a little bit of gel. Voila! Effortless ease. It’s hard to say that the ponytail ever really went out of style. However, there are stylish and modern ways to wear this classic look. They can be worn high on the head, low and off the neck, twisted around, flipped up, and any other ways that can be thought up. So, anyone who still enjoys rocking this old classic, the future is looking bright! These are just a few of the popular hairstyles that can be seen on Pinterest. These are also going to be very popular in the upcoming year 2017, as all these are very trendy. Our Famous Hollywood celebrities are obsessed with these styles. Hopefully, this has narrowed down a few choices because there is certainly no shortage of them.